While we usually trade with weaving groups directly, we occasionally buy from other organizations that share our values and vision. Sop Moei Arts, with showrooms in Chiang Mai and Bangkok, is a case in point. Sop Moei Arts is a self-supporting, non-profit organization that grew out of a public health project founded in 1977 and funded by the Swedish International Development Agency (SIDA). In its first decade, the project focused on maternal and children’s health of Pwo Karen villagers in the remote Sop Moei district of Mae Hong Son province in northern Thailand. During this time there were no other health facilities in the area. Indeed there were no roads and the only access available was by boat, elephant or a trek on foot. More than 30 years later, the project has grown to provide a fair income for hundreds of Pwo Karen villagers while preserving women’s traditional textile weaving and men’s basketry skills. We've known of this project for years, but have only recently discovered sampler packs of their fabrics to share with art quilters and other fibre artists in our part of the world. While the Pwo Karen weavers do not use natural dyes, their strong patterns -- re-interpretations of Pwo Karen traditional fabrics -- are perfect for incorporating into art quilts or fibre art projects of all kinds. 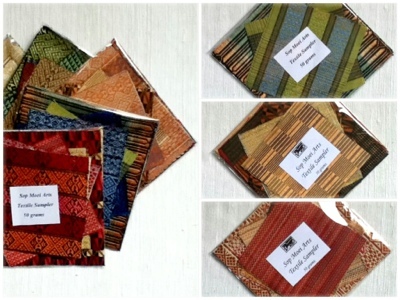 The packs of six or seven small squares, measuring 5" x 5", combined with three larger squares of 6 3/4" offer palettes in oranges, reds, blues, greens or tans. These will be available, along with other samplers of hand-reeled, naturally dyed, organic silks, at our booth in the Merchant Mall at Quilt Canada 2012 from May 29 - June 2, 2012 in Halifax, Nova Scotia. Check our website for details. PSST: Those interested in children's books and education might find interesting this video that documents a bilingual education program for Pwo Karen in Thailand.